When Fiat announced it was selling shares of Ferrari there was a little bit of concern that Piero Ferrari, son of company founder Enzo Ferrari, might end up dumping the 10 percent of the company he still owns as well. But that was totally unlikely from the get-go for complex reasons, and Piero just confirmed it. Who Will Control Ferrari Now? The complex reasons basically boil down to the idea that Fiat wasn't actually selling Ferrari (the company) to a bunch of randos, rather it was just selling just 10 percent of the company to randos, mostly made up of financial institutions, and giving 80 percent of the company back to Fiat shareholders, who are mostly old Italian families. The remaining 10 percent of Ferrari (the company) that Fiat didn't own were controlled by Ferrari (the person), who remained vice chairman of Ferrari (the company). Confused? Of course you are. It's okay. 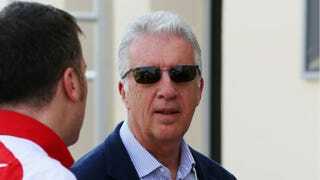 Piero Ferrari, son of the eponymous luxury sports car company's founder Enzo Ferrari, said on Wednesday he had no intention to sell the 10 percent stake his family owns in the company. So there you have it. Ferrari doesn't plan on selling Ferrari anytime soon, as he's probably already having too much fun just selling Ferraris.